The Weekend Gourmet: Celebrating National Burger Month...Featuring Thanksgiving-in-May Turkey Sliders and an Alexia Prize Pack Giveaway! Celebrating National Burger Month...Featuring Thanksgiving-in-May Turkey Sliders and an Alexia Prize Pack Giveaway! Today’s challenge: celebrate National Burger Month while focusing on my May Healthy Eating Month goals. Believe it or not, it wasn’t difficult at all…thanks in part to Alexia Foods. I’ve been a fan of their healthier frozen potato and bread products for years, so I was very excited when they offered to send me a package of their new Sweet Potato Rolls and Sweet Potato Puffs to play around with in my kitchen! I immediately earmarked the rolls to make a healthy slider for National Burger Month. I had planned to serve the Sweet Potato Puffs with my sliders, but we ate them one evening when we needed snacks to enjoy while watching a basketball playoff game. 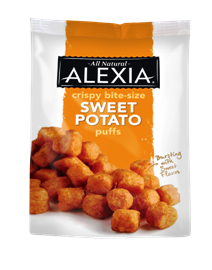 The Sweet Potato Puffs are fantastic if you’re a sweet potato fan…crispy outside and sweet inside! I sprinkled them with a bit of Cajun seasoning before baking, because we love the sweet-spicy combo. These puffs were recently given a 2013 Better Homes and Gardens Best New Product award for a good reason: they’re fabulous! When I was creating my sliders, I did a bit of brainstorming...and ultimately decided that sweet potato reminded me of Thanksgiving. That was the jumping-off point for my quirky little Thanksgiving-in-May Turkey Sliders. They bring my favorite Thanksgiving flavors to a Summer-perfect burger. I flavored lean ground turkey with dried cranberries and green onion...and savory seasonings like sage, rosemary, thyme, and garlic. I topped the sliders with 2% jack cheese and caramelized purple onion. To continue the Thanksgiving flavors theme, I made a yummy sweetly savory sauce with cream cheese, cranberry sauce, and green onions. Each bite of these turkey sliders contained all of my favorite holiday flavors in a fun burger form. These little babies were a big hit at my Memorial Day dinner! This recipe makes 7 sliders, which is plenty to feed 3-4 hungry people; for a larger crowd, just double the recipe. To save time, make the burger mixture ahead…it can actually be refrigerated overnight. While the onions are cooking, make the sauce. Then form and grill the burgers and assemble. These unique turkey sliders are full of flavor and really fun…proving that sometimes, different is good! Step 1: Make the burger mixture by adding the following ingredients to a large bowl: 1 lb. 93% lean ground turkey, 2 sliced green onions, ½ cup dried cranberries, 1 tsp. sage, ½ tsp. rosemary, ½ tsp. dried chives, 1/2 tsp. dried thyme, 1 tsp. granulated garlic, and 1 tsp salt. Using clean hands, thoroughly combine all of the ingredients. Set aside in the fridge for up to overnight. Step 2: Saute 1 sliced purple onion in 1 tbs. olive oil over med-high heat. Stir every few minutes, until the onions are caramelized. While the onions cook, make the sauce by adding the following ingredients to a small bowl: 4 ounces whipped light cream cheese, 1/3 cup whole-berry cranberry sauce, 1 sliced green onion, and salt & pepper to taste. Whisk together until everything is incorporated…yes, it will be pink. 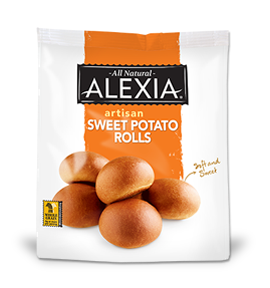 Step 3: Cook one package of Alexia sweet potato rolls according to package directions. While the rolls cook, form the burger mixture into 6-7 burgers that match the size of the rolls. Cook over med-high heat for 3 minutes per side, until the burgers are seared. Reduce heat to medium and cook until the burgers are cooked through; this took about 3 minutes extra per side, but your mileage may vary. Cut 4 slices of 2% jack cheese into quarters. Top each burger with a square of the cheese and cook until melted. Step 4: To assemble burgers, cut each sweet potato roll in half with a serrated knife. Spread some of the creamy cranberry sauce on the bottom half of each roll. Top with a slider patty, some of the caramelized onions and the top bun. To amp up the cranberry flavor, you can add cranberry sauce to the top bun. This is optional, but quite tasty! These fun sliders are so juicy and tasty! Each bite will remind you of Thanksgiving…albeit in a Summer-friendly form. The Alexia Sweet Potato Runs had a light orange color and a subtle sweetness, the savory-sweet cranberry sauce works perfectly with the dried cranberries in the burger, and the seasonings remind me of my Grandma's cornbread dressing! I served these little sliders with fresh corn on the cob, but the Alexia Sweet Potato Puffs would’ve been the perfect addition! I also served a fun beer cocktail with our sliders: a Bohemia Float. This simple and refreshing Summer cocktail is light and fruity...and it's so simple to make: pour three bottles of Bohemia into a pitcher and stir in 1.5 cups of fruit sorbet until melted. You can use any flavor of sorbet, but I opted for strawberry since I really enjoy lambic beer. As you can see, it's a gorgeous red color...and the sorbet provides a mild fruity sweetness. 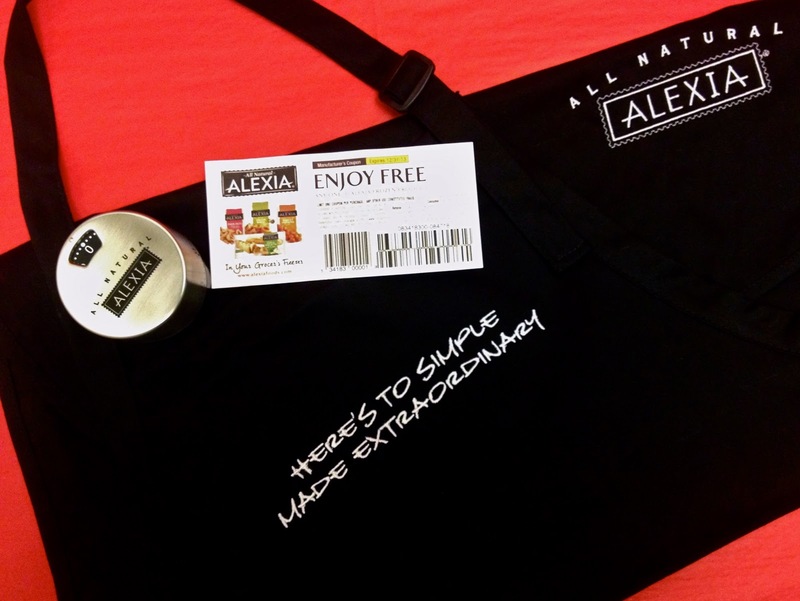 How would you like to win this cool Alexia Prize Pack containing a coupon for one FREE Alexia product, a logo apron, an eco-friendly tote bag, and a kitchen timer? Simply leave me a comment below -- along with your e-mail contact. Tell me your favorite Alexia product OR which Alexia product you're most excited to try. I'll accept entries until this Saturday 6/2 at 11:59 pm, and I'll notify the winner via e-mail on Sunday. It's that simple! Disclosure: Alexia sent me a package of their Sweet Potato Rolls and Sweet Potato Puffs to facilitate this post. Bohemia also sent me samples of beer to share their cocktail recipe. The opinions expressed and the recipe are my own.